You are here: Home » Featured » Army General: ‘Where Were the Churches’ in DADT Fight? Army General: ‘Where Were the Churches’ in DADT Fight? One of America’s most seasoned war generals expressed frustration at the silence of Christian churches as the U.S. military’s ban on open homosexuality fell to a repeal effort earlier this year. 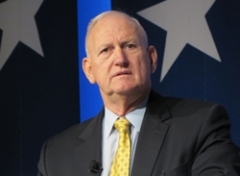 At the Values Voter Summit on Saturday, Lieutenant General Jerry Boykin described the exasperation of pro-family leaders in Washington who found themselves abandoned by church leaders unwilling to make a stand for the “Don’t Ask, Don’t Tell” policy. Boykin, who spent the majority of his career in the Special Forces, was mission commander of the battle portrayed in the Hollywood movie “Black Hawk Down,” and accepted the surrender of Panama military dictator Manuel Noriega in 1989. According to Boykin, “nobody in this country fought a greater fight” against normalizing homosexuality in the military than Family Research Council President Tony Perkins, himself a former Marine who joined forces with senator and fellow veteran John McCain. “John McCain kept turning to Tony Perkins saying, ‘Where’s the church? Where are the spiritual leaders?” said Boykin. Besides a large number of military chaplains, few church leaders in America spoke up publicly against the Obama administration’s campaign last year to pass the repeal in Congress. Notably, while the Vatican had released a statement in 1992 supporting a ban on open homosexuality in the military, the U.S. Conference of Catholic Bishops remained silent on the repeal effort, leaving military Archbishop Timothy Broglio to defend the ban alone. When questioned on the controversy in December 2010, Washington’s Cardinal Donald Wuerl demurred, saying “there isn’t a specific Catholic Church position” on the issue.